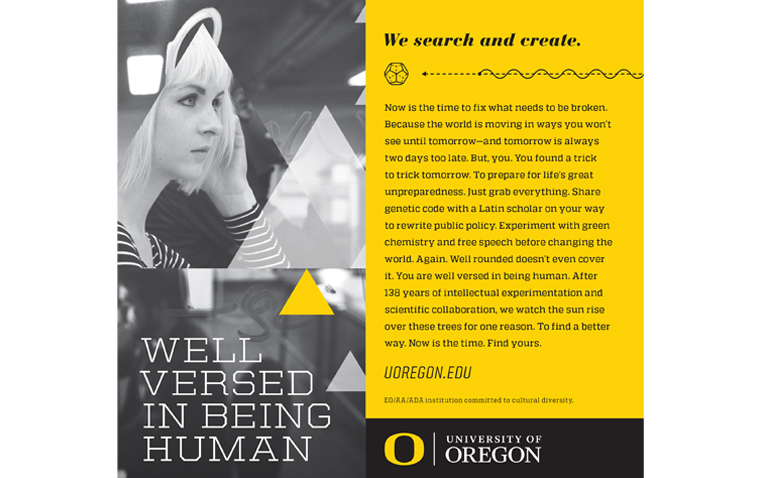 The chance to learn more about the UO’s first comprehensive, integrated communications initiative attracted more than 400 faculty, staff, students and alumni to three events held in Eugene and Portland over the past month. Launched in January, the five-year communication effort is taking University of Oregon stories of excellence to the state of Oregon, the West Coast and to a national stage. The initiative works in conjunction with the university’s $2 billion fundraising campaign, which will help it continue support for students and faculty with the resources they need to pursue research, follow their passions and compete on the international stage. A significant part of the initiative is highlighting the expertise of UO faculty and the groundbreaking research happening on campus. Among the next steps is the establishment of a “media ambassadors” program, which will position faculty experts with national media and showcase the work of our faculty on leading topics. The university has been working with the agency 160over90 on the project, with the goal of helping capture the culture that is unique to the UO in a narrative that can be told and received across the state and on a national stage. The effort will be paid for with private dollars from donors who want to expand the conversation about the UO, the excellent work happening on campus and the bright future of opportunity that exists at the UO for students, the faculty and the entire state of Oregon. The current three-year agreement with 160over90 is for $3.3 million to develop many creative projects, from websites and television commercials to brochures and advertisements. The entire $20 million initiative will also buy advertising and produce new, creative and engaging communication elements.